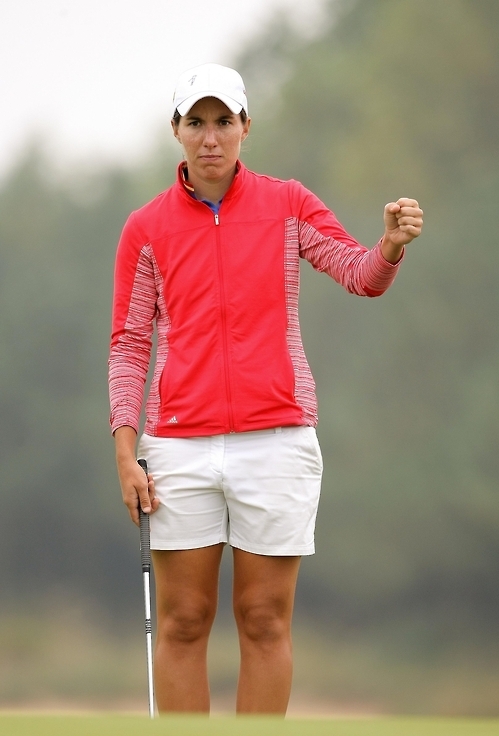 Golfer Carlota Ciganda of Spain earned her first LPGA Tour win in South Korea on Sunday in a playoff. Ciganda defeated Alison Lee of the United States with a birdie on the first playoff hole to take the LPGA KEB Hana Bank Championship at Sky 72 Golf & Resort's Ocean Course, just next to Incheon International Airport. The two players ended the regulation tied at 10-under 278 on the rainy day, and Ciganda, who rallied from a five-shot deficit but also wasted a five-stroke lead on the back nine, needed just one extra hole. This is the only LPGA event held in South Korea each year, during the tour's Asian swing. Seventeen of the world's top-20 players were here. Ciganda had previously won three times on the Ladies European Tour, but never on the U.S. circuit since her debut in 2012. Her victory, worth US$300,000, halted the LPGA winning streak by a South Korean player at three. The two players went back to the par-5 18th for the playoff. Ciganda put her tee shot on the fairway, and stuck her third shot about seven feet from the cup. Lee found rough on the right side of the fairway with her tee shot, and her second shot trickled into rough on the opposite side. When Lee's third shot rolled well past the hole, Ciganda appeared to have wrapped up the victory. Lee, however, nearly drained her birdie attempt from the back of the green, but when the ball stopped just shy of the cup, all Ciganda had to do was make her eight-footer. Ciganda converted the putt to end the day that had little suspense early on but ended with some improbable turn of events. "This win means the world to me, and I am so happy to get my first win here because the women's golf is so big in Korea,"
Ciganda said. "I was telling myself to stay in the present and hit the next shot the best I can. I think my attitude was good the whole week. I was trying to have fun." Ciganda started Sunday five shots behind Lee, the overnight leader, at 13-under, but mounted a furious charge on the front nine. Ciganda birdied the first hole and went on to pick up four more birdies on the back nine to claim the lead at 13-under. Lee, a second-year pro seeking her first win, had consecutive bogeys at the sixth and seventh to fall to 11-under, two back of Ciganda, and fell further off the pace with bogeys at the ninth and 10th. Ciganda also birdied the 10th to open a four-stroke lead over the field. Kim In-kyung of South Korea briefly reached 11-under with a birdie at the 10th but gave a shot back on the very next hole. She lost another stroke at the 13th to trail Ciganda by five shots. And just when it seemed Ciganda would cruise to the title, things began to fall apart, starting at the 14th. Ciganda found a greenside bunker with her second shot and only got the ball out to the thick rough just beyond the bunker en route to a double bogey. Even after the mishap, Ciganda still held a three-stroke advantage over the field with four holes to play at 12-under. Lee then started making her move. She picked up her first birdie at the 15th to get to 10-under, while Ciganda, playing in a group ahead, bogeyed the 16th to drop to 11-under. Lee, who almost chipped in for a birdie at the 16th, pulled into a tie at 11-under with a birdie at the 17th. Lee moved into the lead when Ciganda bogeyed the 18th to finish her day at 10-under. After watching that play develop from the 18th fairway, however, Lee dunked her third shot into water and had to make a nervy bogey putt just to get into the playoff. It was the fourth playoff at this tournament over the last five years, and Ciganda, the steadier of the two, got the last laugh with the clinching birdie. Ciganda said she never gave up her title hope during the topsy-turvy final stretch. "I am an aggressive player, and I like risks," she said. "It was windy at the end, and it wasn't easy. But I like playing in tough conditions. I've practiced in a lot worse conditions."